Nevo C2 review | What Hi-Fi? Although you can perform a simple set-up of the Nevo C2 using only the remote, it's so limited it's best to go straight for the bundled EZ-RC PC set-up disc. This is the same software that so frustrated us on the Xsight range from One-for-All, but it's been seriously improved over the last few months, and you can now teach the remote exactly what equipment you have, à la Logitech's Harmony range. This means that, once you've grouped your devices into an activity, you can click a single button and watch in awe as every relevant piece of kit is turned on and switched to the correct input automatically. You can also customise the remote with favourites for each family member, and complicated macros can be designed if you feel so inclined. 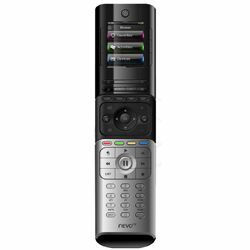 However, while the EZ-RC software can now match Logitech, the Nevo remote itself has a couple of shortcomings. For a start, it's a little too big and unwieldy, and although the large, colourful screen looks as though it's been designed to be prodded directly, it hasn't, relying instead on boring, normal buttons either side. The unit requires three AA batteries, too. Compare this with the more ergonomic, touchscreen Harmony One –which comes with a charge cradle and costs around the same – and we know which we'd buy. Still, the Nevo is now close to that ideal for the first time.